Bakersfield, CA hard rock band THE AVIATORS has released the official music video for the single, "Goodbye to the Rain", filmed at The Canyon at The Rose, off of their latest album, Flowers and Moonshine. 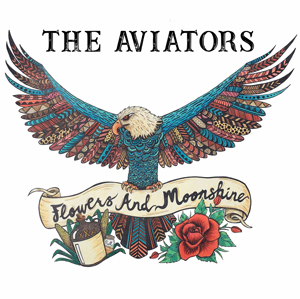 Flowers and Moonshine is the fourth offering from THE AVIATORS, and is a body of work that authentically reflects 10 years of blood, sweat, and beers--a mature effort which showcases both their individual strengths and collective prowess, none more evident than on the single "Goodbye To The Rain". "THE AVIATORS, a homage to the best that rock and roll can provide! We operate out of Bakersfield, CA, and are booking shows throughout the Western region for the upcoming year in support of our fourth album, Flowers and Moonshine. We have a significant following in Southern California and the central coast, and are known for consistent, high-quality performance, as well as engaging and entertaining live shows that have garnered us awards such as the 2018 Bakersfield Favorite, and the 2016 Cathouse Live/Hair Nation Battle of the Bands Champion. We have previously released three albums of original material, which has been consolidated on our streaming sites to The Best Of The Aviators 1-3, with sounds influenced by AEROSMITH, LED ZEPPELIN, AC/DC, and southern rock. Locally we are known for our cover shows, where we play from a catalog of over 100 songs covering the rock classics of the 70's and early 80's. We've been successful playing in LA at venues such as the Whisky A-Go-Go, Redwood Bar, Saint Rocke, The Saban Theater, the Cave in Big Bear, and have been direct support for touring acts at the Canyon Clubs throughout the greater Los Angeles area."